SUCCESS: IR 27434 On 27 January 2016 @ 08H00 in the Cradle of Humankind: Two Black Males were spotted on private property in Oaktree by Members of the Conserv Community, where they were illegally hunting wild animals and birds with 17 of their dogs. A tortoise was also found in the Suspects’ possession. 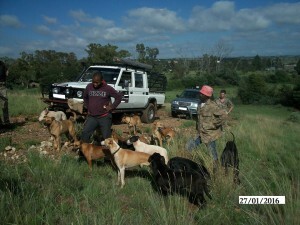 Conserv Staff, the Conserv Community, the SAPS, the Green Scorpions and the SPCA were called out to the scene. Subsequently, the 2 Black Males were arrested for Illegal Hunting and appeared in court the same day. The dogs were taken in by the SPCA. This is a prime example of how Security Companies and Community can work together with the Authorities. Such illegal actions must not be tolerated! Should you have similar incidents in your area, contact our office for support.